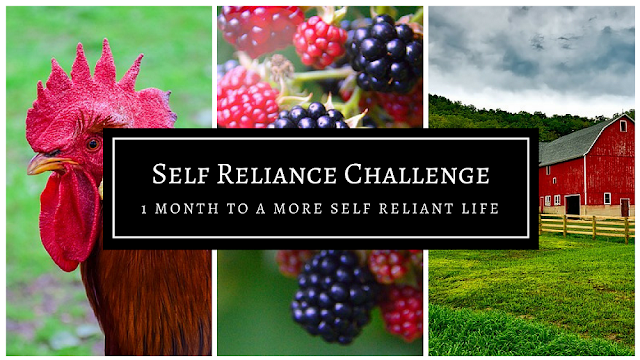 Welcome to the first week of the Self-Reliant Challenge. For the next thirty-one days, I'm joining other bloggers on a quest to be more self-reliant. I'm glad you're here too! I'll link to all of the other bloggers at the end of this post so you can visit their blogs each week. 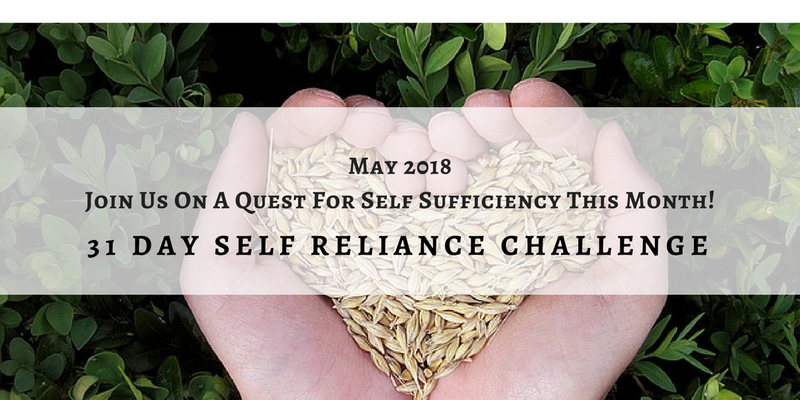 I'll be sharing ideas, plans, and projects that will help you (and me) on the journey to self-reliance. If I find a great tip, I'll share it - and if I have a failure, I'll share that too. Failures are simply opportunities to learn a better way of doing something. In case you're new here, I'll introduce myself. I'm Kathi; hubby and I are empty-nesters now. We've lived here at Oak Hill Homestead for almost fifteen years, and I've been blogging for twelve (in fact, my blog birthday is next week. There will be fun giveaways so I hope you'll "hang out" and participate). 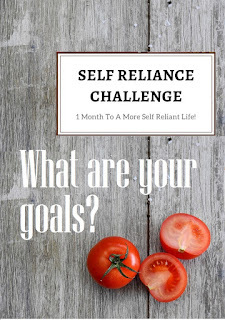 This week I'm talking about goals and why I'm involved in this challenge. You'll get to know me a bit better, and I hope you'll comment at the end of this post (or send me an email) and tell me about your goals too, ok? Self-reliance is having resources and ability to do things and to make your own decisions, without needing help from others. YourDictionary defines self-reliance as "the ability to depend on yourself to get things done and to meet your own needs. An example of self reliance is growing your own food." I was rather surprised to read their example; evidently gardening for self-reliance is pretty main-stream these days. "Mind your own business and work with your hands,"
"doing something useful with [your] own hands,"
and "... be busy at home." My parents and grandparents were outstanding examples of a self-reliant life. I don't want to rely on or be dependent on other people and especially not on the government, which is already stretched thin trying to provide for its citizens. Do I think I will ever be totally self-reliant? No. Ultimately I rely on the Lord. I depend on Him to direct my path, and I want my plans to be His plans for me. I use the gifts and abilities He has given me, and the knowledge He has provided to care for my family and myself; He provides what I need. But my goal is to be as self-reliant as I can be, while still being God-dependent. And yes, there are times that we need help. We are supposed to help others, and sometimes someone else is supposed to help us. There is no shame in needing or asking for help when we need it. We've been there. Years ago as a young military couple with a toddler and an infant, we often found ourselves with more month than money. I remember a day when a sailor came to our door collecting food for military families, and I was so embarrassed that we had nothing in our cupboards. He was back the next evening with a box of food for our family. Sometimes being the receiver is God's intention for us. Now that we are older and wiser, we are better prepared for lean times, and you can be too. Buy a few extra cans of food every time you go shopping. Learn how to can produce. Grow a few plants in containers on your apartment balcony, or start a garden if you have the space. Work toward getting out of debt. No matter what your circumstances are right now, I'm pretty sure you are more self-reliant than you were two years ago, right? Maybe more than last year, last month, last week. Keep striving. Keep learning. subscribe to my weekly-ish newsletter, The Acorn. We store food and water. I'm learning about herbal medicine (there's so much to learn!). We raise chickens for meat and eggs. We've raised pigs, sheep and a steer to fill our freezer. We've also bartered for moose, venison and other kinds of meat. I enjoy gardening and I am so thankful that it's spring again. Mmmmm, fresh tomatoes are in my future! We have fruit trees and thickets of wild blackberries and sand plums. We go to you-pick orchards and fruit stands. 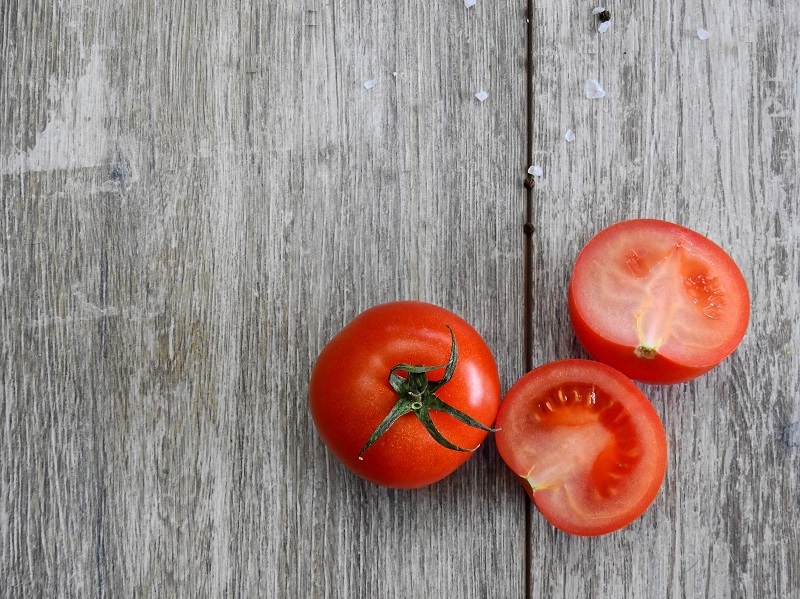 I can preserve fruits and vegetables by canning, freezing and dehydrating. I can forage for medicinal herbs, and for edibles such as lambsquarters, a substitute for spinach. My parents and in-laws were make-do, DIY people. They taught me to sew and crochet, and I've learned other crafts and skills along the way. I make our own soap, yogurt, gifts and personal care products. And I am truly blessed to be married to a man who can do just about anything. I set some goals at the beginning of this year but I've been rather lax about working on them. This challenge is what I needed to get me moving. There are some small projects I need to do, and I'll also share some larger projects, tips and ideas with you during the month. I'm planning to add another raised bed to the garden this year, and move my chickens so they will earn their keep more than in the past. My big goal this year is to be a better steward of what we have, and to waste less. I've written a lot about self-reliance here on the blog, so I'll highlight some of those posts this month too. This week, you might be interested in some emergency-preparedness ideas and projects. Tornado season is here, and we take that very seriously in Oklahoma, so I've swept the storm shelter out and will be restocking it this week. Over the years our electricity has often gone out right before dinner time, and we were forced to search for a restaurant that was still open. Now we have a three-day plan, just in case. We also have a non-electric slow-cooker. What if you don't have a sunny corner in your whole yard? 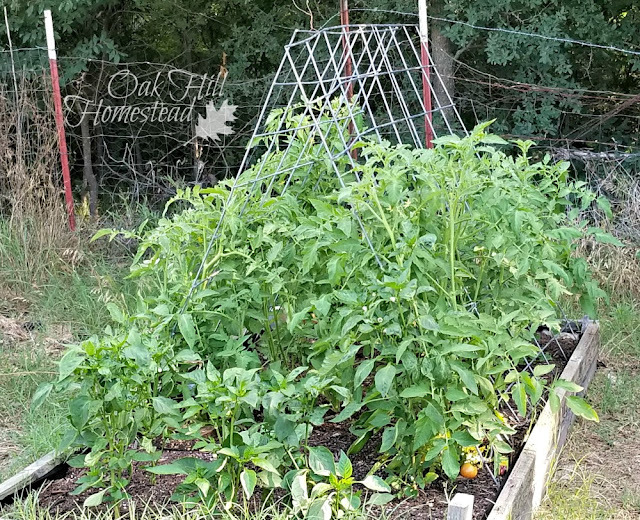 Here are some tips on growing vegetables in a shady garden. Self-Reliant and Self-Sufficient Pinterest board. What are you planning to do this week toward your goals? Leave me a comment below, please. I'm looking forward to reading about your self reliance projects, Kathi! I also need to be a better steward of what I already have...a very good point. Thank you for setting up the challenge, Lisa. I'm headed over to read your post next. Great post! I'm looking forward to the way everyone challenges themselves this month! Thank you, Nancy. I'm so glad you're participating too. :-) There are so many directions we can go when it comes to being self-reliant; I'm excited to see where everyone goes with this. Hi Kathi, Greetings fro South Africa! I enjoyed exploring your blog as a fellow Self Reliant Challenge participant. 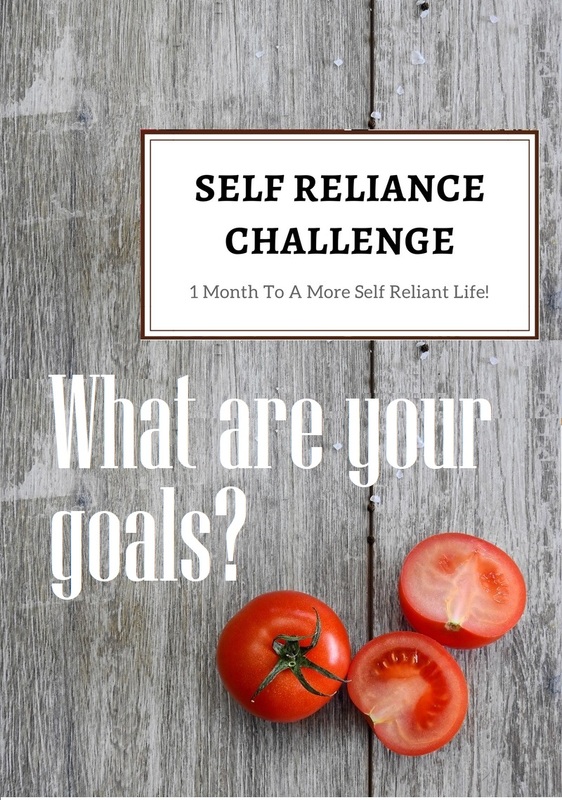 I was challenged by some of your goals and will probably include some of them in my self reliant journey! Hi Frank, it's nice to see you here. I'm excited about everything we'll be doing for the challenge. Thanks for visiting! One natural disaster is the best teacher for self reliance. We struggled like most young people do at the start, but that first hurricane brought home the message. We live in North Texas now so no more hurricanes, but plenty of tornadoes. I'm looking forward to reading more of your posts, Kathi! You are so right, Maria! While we struggled at the beginning of our married life, we learned real fast to make changes. We've since been through blizzards, tornadoes, earthquakes and more - and we've learned something new from each one. No hurricanes though! I absolutely love all your posts as I have been reading them for over a year now. You are one of the people who inspired me to start my blog! I too am researching and learning about herbs for medicines and actually started growing many of them here on my homestead! I can't wait to read your upcoming posts during this challenge! Hi AnnMarie! Good for you for planting medicinal herbs, right on your homestead where you are in charge of how they are grown. Keep it up! It was also nice to be able to use some modern help to get the sump pump running.